The original version of this article, by Eelke Kraak, appeared on ChinaDialogue. The Toktogul Dam in Kyrgyzstan is an imposing structure. The dam guards the largest and only multi-annual water reservoir in central Asia. The cascade of five hydroelectric stations downstream produces 90 percent of Kyrgyzstan’s power. Cotton fields thousands of kilometers away in Kazakhstan and Uzbekistan depend on the release of water from this dam. The Toktogul is literally and figuratively the “valve” of the Syr Darya River. But by relying on large-scale engineering projects to control the river, these countries have ignored the fundamentally political nature of water management. The significance of the Toktogul dam goes beyond its economic benefits. It was the center piece of the Soviet Union’s efforts to conquer nature in its drive to modernize central Asia. When it became fully operational in the late 1980s, the project to control the region’s rivers seemed complete. But the costs have been high. The Aral Sea, the terminal lake of the main sources of water in central Asia, the Syr Darya and Amu Darya rivers, has shrunk to almost nothing. Many areas surrounding what is left of the lake are heavily polluted. Moreover, the now independent Syr Darya riparian countries – Kyrgyzstan, Uzbekistan, Tajikistan and Kazakhstan – disagree on how the Toktogul should be operated. 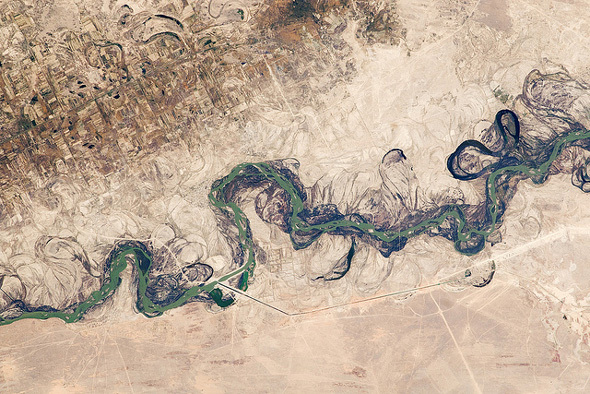 Syr Darya River Floodplain, Kazakhstan, courtesy of NASA and the Center for Philosophy of Sciences of the University of Lisbon.